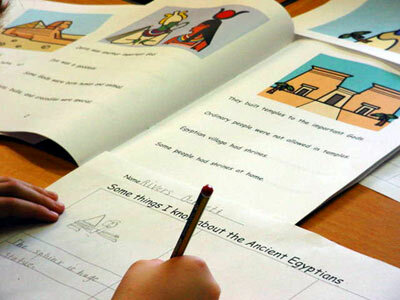 Differentiated Books enable students to take part in a lesson at their own level of understanding. There are five different levels with combinations of text and symbols (see below) allowing information to be matched to learners. What are Differentiated Books ? Differentiated books are books which convey similar information to pupils who are at different levels of reading and understanding. Within any class grouping there can be pupils with widely varying reading ability. Levels of understanding may also vary as some good mechanical readers may have limited understanding of vocabulary and concepts. For instance in a Year 3 class there may be reading ages from Level 2 to Level 5. This makes finding suitably differentiated information texts for Science and the Humanities hard. The differentiated books allow information to be matched to learners using combinations of text and symbols.